Three generations of the Norris family. L-R Butch Herman, Matthew Norris Herman, Lloyd Norris, and Lela Norris Herman. 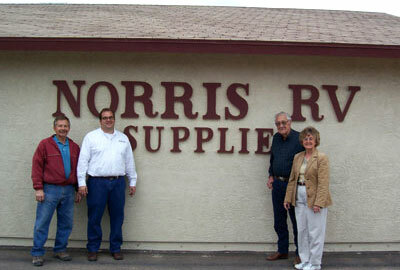 We are a family owned and operated RV parts, sales and service company in business since 1993. We have had another business in this location since 1952. Our facilities on 3.5 acres consist of an 1800 sq. ft. retail store, 6650 sq. ft. warehouse with shop and 25,000 lb. lift. We also have fenced and lighted space for RV storage.